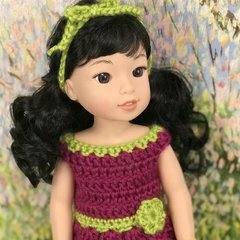 Showing results for tags '18 doll clothes'. Hello everyone, My name I Autumn. I am, since December 20 was my B-day, now 41. I have three kiddos; Brianna (20), Ricky (10), and Ashley (will be 9 in month and a half). Like to crochet, and knit a bit too. Really, I do a little of several crafts, just have phases that rotate! Like trying new crafts, or maybe new technique for an old craft. Love to bake, and candy making has pushed up recently. Hope that's what you were looking for, if not you'll get a better sense of me, in time, in any community interactions here! Looking forward to all the possibilities from this site, and maybe being able to share something I do or know back to brighten your experience here, too.